This Hearty Instant Pot Coq Au Vin Blanc is a classic comfort food. A twist on the traditional Coq au Vin (which is made with red Burgundy wine), this pressure cooker recipe is made with dry white wine and pairs so well with heavenly Instant Pot mashed potatoes and parsnips. So this Instant Pot Coq au Vin Blanc is a departure from most recipes I’ve posted so far. It has relatively few spices and it’s subtle, but it’s just so dang tasty! 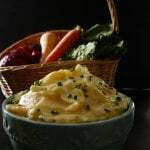 And you’ve GOT to try it with Instant Pot mashed potatoes and parsnips. 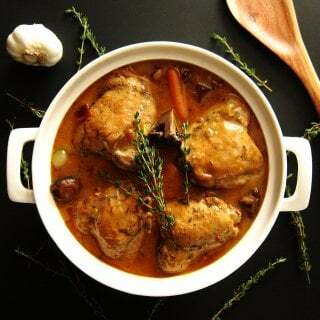 Coq au Vin (pronounced as Kok-oh-van and translated as ‘rooster with wine’), is a rustic French stew traditionally made with red wine – usually Burgundy wine. 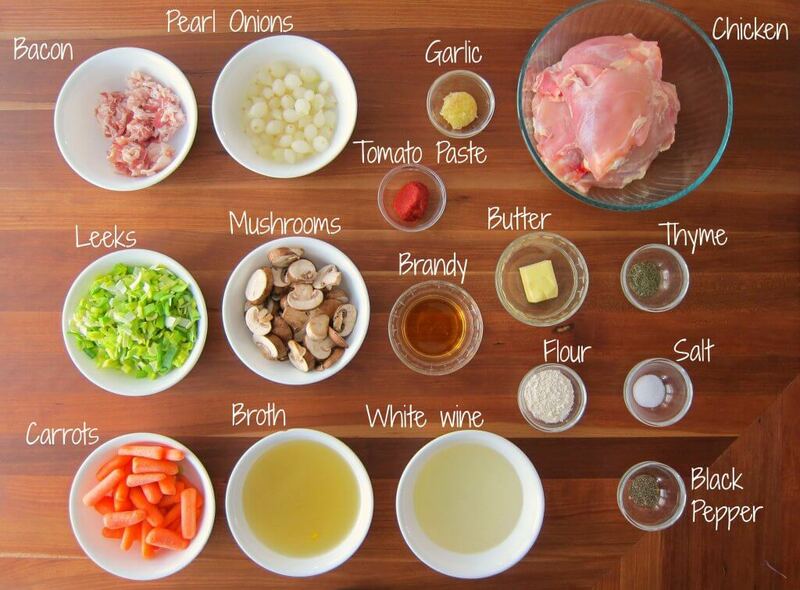 Coq au vin blanc (white coq au vin) uses dry white wine. 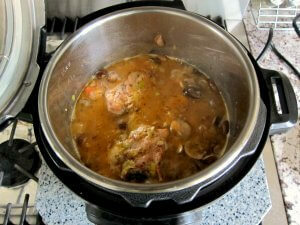 recipes, this pressure cooker recipe is an adaptation of my stove-top version. In addition to the white wine, I also use brandy to deglaze. But if you don’t have brandy on hand, just omit it and deglaze with white wine instead. If you use homemade chicken broth (so easy to make in the Instant Pot), the taste is going to be even better. 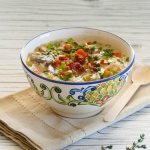 Here’s a chicken broth recipe from Pressure Cooking Today. The part of this pressure cooker coq au vin recipe that takes time is the browning of the chicken pieces. You’ll have to do it in a couple of batches because you don’t want to overcrowd the meat, so it can take up to 20 minutes total. But it’s totally worth it – browning seals in flavor and also produces the little brown bits that get incorporated into the stew to add tons of flavor. If you need to, you can adjust the heat in ‘Saute’ mode. To do this, press ‘Saute’, then press ‘Adjust’ until the heat is at the desired level. If the inner pot gets too hot while cooking any of the ingredients, turn off the Instant Pot for a couple of minutes until cooled down. The dish is finished off with a butter and flour mixture to thicken it. Beurre manie (pronounced burr-man-yay) means ‘kneaded butter’ and is a technique used to thicken soups and stews. I mix together butter and flour and drop it into the gravy, a teaspoon at a time. The butter melts and the flour thickens the dish with no clumps. There are a couple of things you can do to make the dish healthier: use corn starch to thicken the stew instead of butter and flour, omit or reduce the quantity of bacon, use vegetable oil instead of bacon drippings to fry the chicken and vegetables. I do have to point out that you’ll give up some flavor if you choose any of these alternatives. One more thing I need to mention: be sure to wash the leeks very well. Leeks tend to have a lot of dirt between the layers. I like to discard the tough darkest green part, cut the remainder into quarters lengthwise, and then into small pieces. I then place them in a bowl of water and use my hands to get the grit off. Once that’s done, I drain them in a fine mesh sieve and run water through it. Instant Pot Coq au Vin really tastes wonderful when served with Instant Pot Mashed Potatoes and Parsnips. 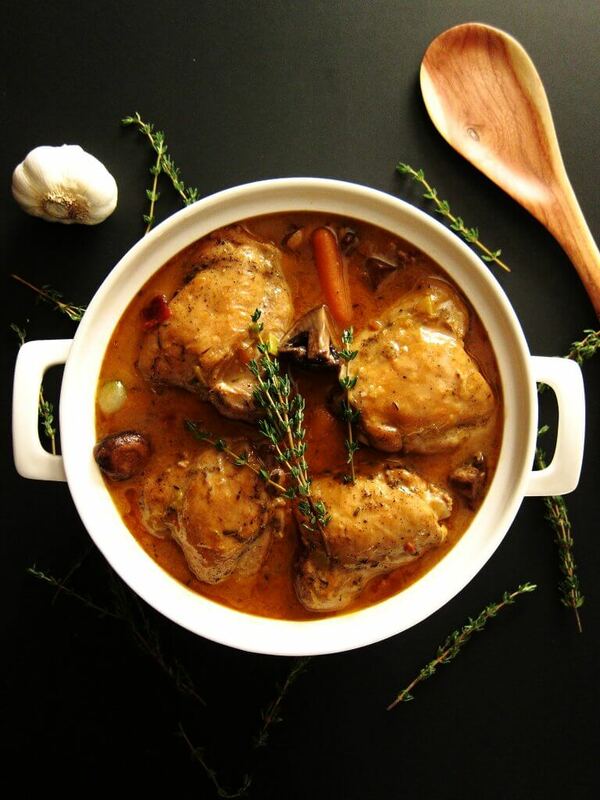 If you’re new to the Instant Pot and aren’t familiar with how to use it, please read the Instant Pot DUO Beginner’s Quick Start Guide or the Instant Pot ULTRA Beginner’s Quick Start Guide first and then come back here to learn how to make this Instant Pot Coq au Vin Blanc. Press ‘Saute’ and cook bacon until crisp. Pat chicken dry and rub with salt and pepper. Press ‘Saute’ and brown the chicken in batches. Remove and set aside. Saute mushrooms and set aside. Cook leeks and carrots till leeks are soft, about a minute. Stir in tomato paste and garlic and cook till tomato paste begins to change color and/or begins to stick to the bottom of the pan, 2 to 3 minutes. Stir in chicken, wine, broth, pearl onions and thyme. Make sure the steam release handle is in the ‘Sealing’ position. Press ‘Manual’ (or ‘Pressure Cook’) and ‘+’ or ‘-‘ until the display reads ‘12’. The display will count down from 12 to 0; it will then switch to ‘Keep Warm’ mode and display ‘L0:00’. While Chicken is cooking, make the beurre manie by mixing together softened butter and flour. Add in the reserved sauteed mushrooms. Drop the butter and flour mixture into the Instant Pot using a teaspoon. Stir the coq au vin and simmer until thickened. Top each serving with bacon. This hearty Instant Pot Coq au Vin Blanc is a classic comfort food. A twist on the traditional Coq au Vin, this dish pairs so well with heavenly Instant Pot mashed potatoes and parsnips. Pat the chicken dry, and sprinkle both sides with salt and pepper. Press 'Saute' and cook bacon until crisp. Press 'Cancel' and remove bacon; set aside. Press 'Saute' and brown the chicken in batches. Remove and set aside. Cook leeks and carrots till leeks are soft, about 1 minute. Stir in tomato paste and garlic and cook till tomato paste begins to change color and/or begins to stick to the bottom of the pan, about 1 to 2 minutes. Turn off Instant Pot and deglaze with brandy, until almost evaporated, stirring often. Stir in chicken, wine, broth, pearl onions and thyme and close the Instant Pot. Cook on 'Manual' (or 'Pressure Cook') for 12 minutes. While Chicken is cooking, mix together the softened butter and flour. 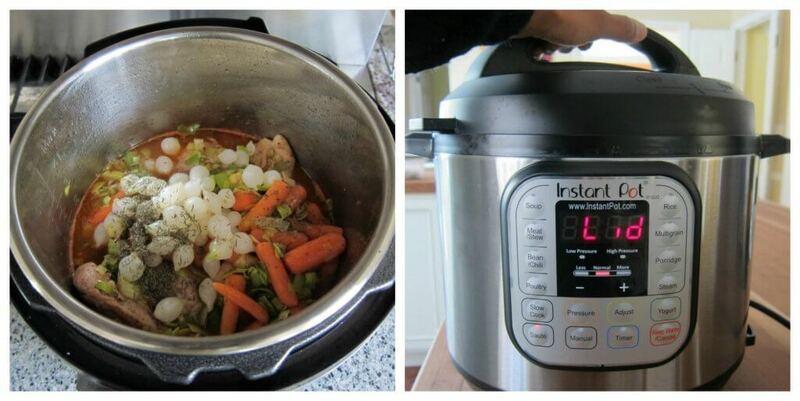 Do a Quick Release of pressure and open the Instant Pot. Stir in the sauteed mushrooms. Press 'Saute' and drop the butter and flour mixture into the Instant Pot using a teaspoon. If the Instant Pot gets too hot while sauteing the first set of ingredients, turn it off to cool it down every so often. Feel free to saute the mushrooms with the other vegetables and let them cook with the chicken. I've done this, and the mushrooms were not overcooked. Thank you for the background notes on this iconic French dish. I admire how you weave this type of narrative into your directions and tips for the recipe. My mouth is watering just thinking about it! A must-try dish on a cold evening, at a candle lit table, surrounded by friends and family. Thank you Lindsay. It really is a wonderful dish and especially so on a cold evening! This sounds delicious! I do not have an instant pot (yet), but it seems I could just make this on the stove, or perhaps the slow cooker, as well. The flavors sound great! Thanks Danielle! Yes, you can make it on the stovetop. Never tried the slow cooker, but that should work too. Made this tonight and my wife gave it a thumbs up. that says a lot. Great recipe! Peter – I’m so glad she liked it. Thanks for commenting and letting me know! For a more traditional cow au Vin can I just put red wine instead of white? Hi Ella – I don’t see why not. I say go for it. I’d love it if you can report back with your experience. Very tasty. I had to make several adjustments, though. The most significant was cutting the broth and wine by half. 2 cups of each is too much liquid. With just 1 cup of each I got an appropriate amount of liquid to make gravy at the end. I couldn’t find fresh thyme today, so about a teaspoon of dried herbs de provence worked fine. I also added in the mushrooms with everything else rather than stirring them in at the end. That was fine, no loss in texture and the mushrooms add a lot of flavor. Hi Carmela, thanks for taking the time to comment. I think of coq au vin as being a stew, and I like to mop up the liquid with a hunk of French bread 🙂 I’ve not felt that it was TOO liquid-y especially after adding the beurre manie. That being said, I will make it again soon and make sure I didn’t make a typo! Glad you liked the flavor, though. Made this last night. It’s definitely labor intensive, but so rich and yummy! I replaced the white wine with red, and I didn’t have brandy, so I used some balsamic vinegar. I followed the advice on a couple of the comments and reduced the liquid to 2 cups total (1 cup broth and 1 cup wine). After thickening (with cornstarch), it was still a stew, but I loved it! Delicious!! Hi Deb, for me the most effort comes with the browning of the chicken pieces, in order to get a nice browning. I have it on my list to try this recipe out again with less liquid, and once I do I’ll possibly update the recipe to account for this. Thank you very much for your comment! A lot of effort for mediocre results. Way too watery and not very flavourful, even after adding more seasoning. I’m sorry it didn’t meet your expectations, Zach. I think a few other readers have halved the quantity of liquid and been happy with it, in case you decide to try again. I read the instructions a few times, but I do not see when to add the leeks and carrots. Do you add with the wine and broth, or after with the mushrooms? Hi Karen, the leeks and carrots are added in step 5 of the recipe card. After the mushrooms. Great recipe! I had to adjust the seasonings since I thought I had thyme but I could not find it when I started cooking. I love the thickening tip, but I would reduce the amount of flour the next time I make it, as it was a bit too thick for my taste. I will definitely make it again. Thank you for posting! Great recipe! I had to improvise the seasoning since I thought I had thyme until I started cooking. I will definitely make this again, but I would reduce the amount of flour as it was a bit too thick for my taste. Thank you for posting. Hi David, Thanks for your comment; glad you liked the recipe. You can also add a bit more liquid and make it less thick. 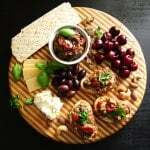 We have made this recipe twice now, and it has been fantastic both times. We skip the brandy and add a bit more flour but follow the rest of the instructions to a T and put it over a bed of mashed potatoes. Thank you! this will be a monthly recipe for us moving forward. Terrific, delicious, definitely a keeper! Thank you, Aldo, for taking the time to comment. I’m excited that you liked the recipe! I followed the recipe exactly. Although it tasted good, it was a big mushy mess – nothing like the picture. Glad I tried it for ourselves before serving it to guests. The chicken should have been cooked before the veggies were added. I will not make this again. I guess some dishes should not be made in an IP. Jan, I’m sorry the recipe didn’t meet your expectations. Sounds like your chicken overcooked but I’m not sure what happened because I and many readers make this recipe and it isn’t mushy. Maybe the model of Instant Pot or the cut of chicken, the size of chicken? The veggies can be cooked separately if you want them crisper. I loved this! It came out perfectly done and the chicken was so tender it fell off the bone and the flavors melded perfectly. Definitely adding this to my go to recipes. Thanks for the comment – I’m really happy to hear you liked the recipe!